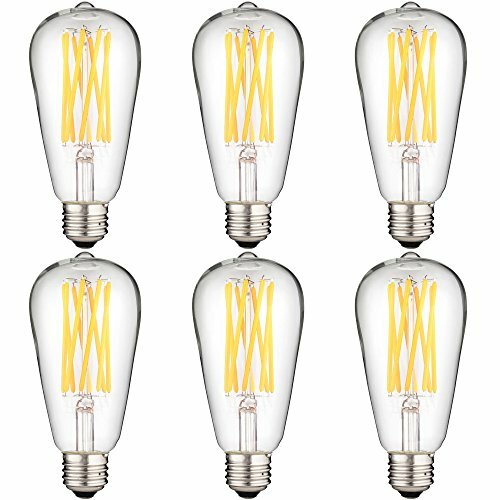 This is a Sunlite S19 LED 8 Watt Antique Style bulb in warm white. This bulb's design and warm light will help you achieve a throwback ambiance casting an inviting glow while giving you the energy savings of an LED. You can control the brightness using a compatible dimmer and its medium base ensures it will fit into most lamps, ceiling fixtures, lamps, and wall mounts. Lastly, this bulb will last about 25,000 hours or about 22 years (based on a 3 Hr./Day Avg. use), and is rated for safety and energy efficiency. This bulb can be expected to afford approximately $93.00 in energy savings over its life. ANTIQUE STYLING - Perfect for any large or small room where you are trying to achieve a retro look. MEDIUM BASE - Fits most ceiling fixtures, lamps, and wall mounts. ENERGY EFFICIENT - Save an estimated $93.00 on your electric bill over the life of this 8 Watt LED (60 Watt Equivalent). LONG LAMP LIFE - Lasts up to 15,000 hours or roughly 13 years based on 3 Hr./Day use). ETL - This bulb has been listed as ETL compliant for safety.